Legal accessibility has traditionally meant that citizens may review the law via the contemporary technology, and redistribute it at will. In ancient courts, this implied open public access to the proceeding itself. Indeed, the principle was literally built into the architecture of the courthouses. As American law matured, it incorporated a right to read and reproduce the text of decisions without paying a license fee. The Copyright Act specifically exempts all government works from monopoly protection because such works essentially “belong” to the people. In the internet age, what constitutes a public right to court records? Internet natives expect the government to be accessible online. The US Courts were remarkably prescient in this regard, implementing electronic access to case information as early as the 1980s. However, this access came at a price. In order to fund electronic access to court records, the judiciary decided to charge user fees for every minute of dial-up access. As the web matured, the courts transitioned to the new platform and perpetuated a fee-based model. The motivation was understandable: new services cost money. However, some people began to argue that the price for this model included not only transaction costs for users, but also decreased legitimacy, accountability, fairness, and democratic due process at the heart of of the open access doctrine. The fee-supported structure of PACER has been allowed by Congress, most recently in the 2002 E-Government Act. The courts use the fees they collect from PACER users to maintain and upgrade the PACER system, but also for for other purposes. The E-Government Act also made clear that the courts should be moving toward free public access to court records. Indeed, in February 2009 Senator Joe Lieberman (I-CT) wrote a letter to the judiciary encouraging the courts to expand free public access to court records, and followed up in March 2010 indicating that spending on non-PACER expenses may work against the Act’s mandate. “The Committee intends to encourage the Judicial Conference to move from a fee structure in which electronic docketing systems are supported primarily by user fees to a fee structure in which this information is freely available to the greatest extent possible”. Letters exchanged between the Administrative Office and the Senate Committee on Homeland Security and Government Affairs (HSGAC to AO, the AO Response, and HSGAC to Appropriations). My short piece from 2010: "What Does It Cost to Provide Electronic Public Access to Court Records?" My 2008 working paper: "Electronic Public Access Fees and the United States Federal Courts' Budget"
The Administrative Office and the Judicial Conference are not in compliance with statute. More importantly, fee-based access to the digital public record is inconsistent with constitutional principles of public access to the courts. In the legacy of Richmond Newspapers v. Virginia, the courts should offer access for free. Bulk access to all records need not be expensive, and could yield tremendous democratic benefits. The courts claim that they have taken several steps to mitigate the harm of the PACER paywall--fee waivers, quarterly minimums for billing, publishing opinions "for free." 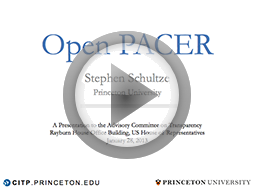 Nevertheless, researchers, advocates, and everyday citizens regularly encounter the PACER paywall as an insurmountable obstacle to their work. Researchers are unable to pursue corpus-wide research that might yield significant insights into the Judiciary. Advocates are unable to perform valuable oversight (see, e.g., Gollan v. US Courts (docket 12-16373) in the 9th Circuit. Citizens accustomed to "googling" government records do not even find PACER, or are deterred by its requirement for credit card information, or are frustrated by expensive and confusing search queries.